Echo is your grandmother’s lemon bars captured in a chapter book – separate layers that when eaten together form a luscious composite of sweet sugar, tart lemons, and crunch all topped with powdered sugar that together surprise your tongue. In Echo, the layers are the three separate stories of Friedrich, a German prodigy, Mike, a Pennsylvania orphan, and Ivy, a bright, worried California girl. Their tales blend via a magical harmonica and a fable from the past that involves a promise and a prophecy. Author Pam Muñoz Ryan’s award-winning children’s books, including Esperanza Rising, The Dreamer, Paint the Wind, and Becoming Naomi León, are all narrative treasures but Echo is surely her magnum opus. Echo combines a fairy tale, the three narratives, and music to form a wonder of a classic, yet fresh, novel that will enchant children ages ten to fourteen and their parents and teachers. The story begins, as so many great fables do, in a dark forest where a boy is reading a book with a title containing his given name: The Thirteenth Harmonica of Otto Messenger. When Otto gets lost in the forest, he meets three mysterious sisters who are under a witch’s curse, receives a special harmonica, makes a promise, hears a prophecy, and returns home to become the messenger and break the curse. Many, many years later in 1933 in a German town near the Black Forest, Friedrich, the musical prodigy with an unusual birthmark, works alongside his father in a harmonica factory where he discovers an older version of the Marine Band model the company exports to America. It contains a tiny red letter M. The harmonica has a “rich, ethereal quality . . . the more he played, the more the air around him seemed to pulse with energy. He felt protected by the cloak of the music as if nothing could stand in his way.” Protection may be what Friedrich needs when his beloved sister comes home from nursing school saying that she believes in Hitler and what he stands for and others in his town want to remove him and his imperfection. Later in 1942 in Fresno County, California, Ivy Maria Lopez receives a new harmonica with a tiny red M on one edge. When she plays it her teacher asks her to perform a solo of “America the Beautiful” on the radio with her class, but her family must move to a farm near Los Angeles. Her new school segregates the Latino children in a separate school with no orchestra, but Ivy has high hopes even when she learns of another injustice. How will the magical harmonica link these stories and will Friedrich, Mike, and Ivy ever achieve their dreams? Children and adults will savor the delicious blending of these tales into a superb conclusion. In an interview with Publishers Weekly, Muñoz Ryan said, “Echo is about how music illuminated my characters’ lives during a very bleak time. I think most of my books are about these journeys where the characters have to grow and change drastically, whether the journey is an emotional one or a physical one. And if you look back to Esperanza Rising, even during the darkest time in her journey, there was always something inside her giving her the determination to carry on. I hope that the reader will enjoy the book for the story’s sake, but also that something will remind them that even during the darkest times, something pure and beautiful exists. Like music. " Summing it Up: The magic of this fairy tale combined with carefully told twentieth-century history will captivate chapter book readers as well as their parents and teachers. The triumphant crescendo of an ending ties the story together in a most satisfying and glorious way. Children’s historical fiction is sometimes bland and saccharine, but Echo is a John Philip Sousa, brass band, cymbal-clapping winner that everyone over the age of ten will love. The Nightingale opens in 1995 as an unnamed woman packs her belongings to move into a nursing home at the urging of her son. She ponders, “If I have learned anything in this long life of mine it is this. In love we find out who we want to be; in war we find out who we are. . . . I find myself thinking about the war and my past, about the people I lost.” Her receipt of an invitation to a ceremony for the passeurs, the courageous men and women who helped many escape during WWII, leads to more memories. A few pages later, it’s 1939 in a small Loire Valley town where Viann, a young mother, adjusts to life under the German occupation while her husband is away fighting. Meanwhile Viann’s father has sent her impetuous younger sister, Isabelle, away from Paris to live with her. The two sisters haven’t gotten along for years and Isabelle’s defiance that led to her dismissal from school doesn’t bode well for life under the occupation especially when a German captain comes to live with them. Soon Isabelle is secretly delivering papers for the resistance when a chance encounter with a downed British Airman leads her back to Paris where she joins others in planning ways to get men out of the country. She risks her life to save numerous downed paratroopers and scenes depicting her courage, grit, and strength set this novel apart from other tales of the resistance. While Isabelle travels the country, the Nazi attitude toward the Jews in the Loire Valley grows more hostile, and Viann finds herself risking her own life and that of her daughter to save the lives of other children. Viann’s growth as a character and her decisions to do what she must to survive strengthen the narrative. The suspense behind which sister’s memories recount the tale and the uncertainty as to whether one or both survived the war makes this more than a simple recounting of their heroics. Kristin Hannah’s previous novels have primarily been light, domestic dramas – more beach reads than anything serious; The Nightingale is different. While researching her earlier novel The Winter Garden, a book partly set in WWII Russia, Hannah read about Andrée de Jongh, a 19-year-old Belgian woman, who, along with her father, started an escape route through the Pyrenees Mountains to get downed airmen out of Nazi-occupied areas. That story led Hannah to research what ordinary French women had done to help the resistance and The Nightingale emerged. Author Hannah says that the book became the story of “women in war, period. Our stories and our bravery are not acknowledged and talked about as much when it's over. Perhaps that's because women just come home and go back to their families and their ordinary lives and don't talk about it too much. 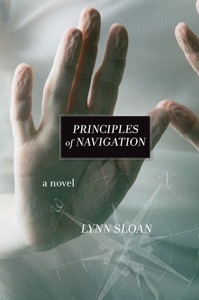 Principles of Navigation is Lynn Sloan’s first novel and the influence of her training as a fine art photographer surfaces on each page. She offers a developing portrait of a marriage that evolves as would a print in a darkroom water bath. This particular marriage between Alice, a small town reporter, and Rolly, an art professor at an undistinguished Indiana college, is seen in separate shots of each character that together form an image of their changing lives. “We are perfect here, aren’t we?” That’s what Rolly had said not so long ago. When Alice achieves her goal of becoming pregnant, Rolly seems indifferent and they begin to drift apart and she starts questioning their planned sabbatical year in Norway. Rolly would have his art but she’d have no work and would be isolated. When Alice miscarries, Rolly realizes that the baby meant more to him than he’d realized but Alice can’t bear to think about the happier times reflected in their wedding picture so she hides it away not even remembering where. “You have no right,” she said, over her shoulder, then turned to face him. He didn’t get it. His uncomprehending eyes searched hers. She pushed her hands at him, to make sure he didn’t come closer. “You spoiled this. This wasn’t supposed to be touched. Why did you set your crap up in here? Just get out. Get the hell out.” . . . He knew. He didn’t care. His teary eyes were a pretense of caring. He tried to put his arms around her. As these two broken people make damaging decisions while struggling to find a way to either fix or abandon their marriage, Sloan’s evocative pictures of them and their lives, offer a new way of seeing ordinary people. And then comes the unexpected twist and it’s a twist that makes this a novel that book clubs will find irresistible. Long after you read the last joyful paragraph, you’ll be talking about the ways these two unlikely characters found to navigate their lives. Summing it Up: Step into Principles of Navigation, a stunning photograph of a marriage that debut novelist Sloan develops before your eyes. Fall into the lives of two broken, imperfect individuals and stick with them as they find new ways to navigate the lives they’ve created so they can become whole. Select this for your book club and enjoy discussing the unexpected twists and turns that lead to the evolving image of an unconventional family. Mind of Winter chronicles a single Christmas day in a Detroit suburban home. Holly’s sleep is interrupted by a strange sensation that “Something had followed them home from Russia.” When Holly and her husband Eric oversleep, Eric must race to the airport to pick up his parents while Holly finds that their 15-year-old daughter, Tatiana, hasn’t gotten out of bed either. Holly ruminates on her unsettled feelings throughout the day while remembering the Christmas when she and Eric had gone to Siberia to adopt Tatiana. As the day’s snowstorm turns into a blizzard, none of their family or friends are able to come for the planned feast and Eric has to detour to a hospital when his mother’s confusion needs attention. Left alone with Tatiana all day, Holly ruminates on her daughter’s shortcomings – she hasn’t even set the table – as well as her rare Russian beauty and her kindness toward everyone but Holly. As the day wanes and the blizzard gains strength, the house appears to be haunted with a strange aura or could it be that Holly is imagining it? Author Kasischke is an accomplished poet and the rhythmic language she weaves to highlight Holly’s repetitive cogitations gives the novel an eerie feeling that escalates as evening approaches.The reader begins to wonder if Holly is truly disturbed or just neurotic and anxious because of the unforeseen changes in the day. Holly’s bizarre behavior continues and ultimately leads to an unexpected and chillingly horrifying ending. Kasischke sets each word as if she were a mosaic artist placing intricately shaped and colored tiles to form a mural that won’t reveal its subject until the viewer steps back and views it in its entirety.The disturbing conclusion will appeal to Gone Girl and Stephen King fans as well as to readers looking for a smart, fast-paced, disconcerting tale. Summing it Up: If you’re looking for a searing psychological thriller that will leave you shaking with its shocking conclusion, read this book. You’ll want to devour it in one sitting and if you’re anything like this reader, you’ll immediately turn back to page one and start again to appreciate the craft and to examine the way the puzzle pieces fit together. Just Mercy: A Story of Justice and Redemption is a book EVERYONE needs to read. Desmond Tutu calls Stevenson “America’s young Nelson Mandela” and John Grisham compares him to a living Atticus Finch. Yesterday I co-led a discussion of Just Mercy at my church. Twenty-eight people showed up (in the Chicago suburbs in February) and our spirited discussion of the disparities in our justice system led to many comments and questions about the book, about Stevenson, and about what ordinary people can do to help. Bryan Stevenson is a crusader but he’s also a fine storyteller who personalizes the lives of the incarcerated and those on death row to make the reader care deeply about them and him. The story of Walter McMillan, a man wrongly sentenced to die for a crime he clearly didn’t commit, is the tale that ties the book together. Everything about his wrongful conviction from the fact that he was put on death row BEFORE his trial, to the intimidation of witnesses and Stevenson himself, depict a story so very wrong that it seemed almost over the top. It took Walter’s appearance on “60 Minutes” to set the wheels of justice moving in his case. Other stories portray injustice in many forms. Those of children sentenced to life in prison, of a mistreated veteran suffering from PTSD and a head injury, of the mentally ill put in solitary confinement, and of a woman charged with killing her stillborn baby - will make you cheer for Stevenson’s resolve. This book is a memoir as well as the telling of what happens to the powerless and the glimpses into Stevenson’s personal life enhance the story and its message. Stevenson presents facts that make all of us, regardless of politics, see that this is a problem that affects our economy as well as our desire to do what’s right. Bryan Stevenson believes that “Each of us is more than the worst thing we’ve ever done.” He points out bad people in the system who are protecting their own power by ruining the lives of the powerless, but he also presents hope. I encourage you to get your book club, your neighbors, or your faith community to read this book with you. Our group began by watching Jon Stewart’s six-minute interview with Stevenson on the Daily Show, but you could also ask your fellow readers to watch Stevenson’s TED Talk on Injustice before reading the book. It’s one of the best twenty minutes I’ve ever seen on the internet as supported by its 2,059,213 views. Exactly six months after Michael Brown died in Ferguson, Missouri, this is a book that can help all of us talk without rancor about what can happen if any part of our population sees itself as marginalized. This is a book that can help us do better. Summing it Up: Just Mercy is the powerful memoir of one man’s quest to work for the poor, the oppressed, the mentally ill, and the powerless. It will make you mad and it will make you cheer. As a citizen of the world, you must read it. Descent is a compelling literary thriller that illuminates the lives of a family falling apart after their daughter disappears on what should have been a happy vacation. Caitlin’s fifteen-year-old brother, Sean, follows her on a rented mountain bike as she runs through the Rocky Mountains on her pre-college trip. He crashes and breaks his leg and since there’s no cell service, Caitlin accepts a stranger’s offer to drive her into town to get help. Soon their parents receive a call that Sean is in the local hospital and they realize that Caitlin is missing. As Sean recuperates from his physical wounds, the search continues and the family disintegrates. Angela, the mother, returns to their Wisconsin home while Grant, the father, and Sean remain to search for Caitlin. During the following two years, when there doesn’t seem to be any hope of finding Caitlin, Angela attempts suicide, Sean wanders through the west getting into skirmishes, and Grant stays in the resort town where Caitlin disappeared and builds a life of odd jobs, drinking, and monitoring the search for Caitlin. The climax builds when a minor character acts recklessly to set the thrilling denouement into motion. As I held my breath, wiped my tears, and thanked the stars for an author like Johnston, the book put me on a roller coaster ride that held a twist I could never have imagined. The minute I finished this book, I wanted to find someone, somewhere, who’d read it so we could talk about hope, courage, and determination. We’ve all read tales with similar plots, but we rarely read books with both the exquisitely evocative language of this novel and with a hold-your-breath, take-no-prisoners ending. Descent has the gothic feel of something by Dennis Lehane, Ron Rash, or Russell Banks coupled with the immediacy and psychological drama of Emma Donoghue’s searing novel Room. At times this novel is painful; I set it down and walked away twice needing to do something ordinary. After I folded laundry and looked outside my window to convince myself that I wasn’t being held captive in a mountain cabin, I returned to Descent anxiously awaiting Caitlin’s fate. Despite my forays into the quotidian, I finished the book in just over a day and predict a similar fate for most readers. Summing it Up: Descent is a rare mixture of poetic words, heart-rending action, courageous exploits, superhuman survival tactics, fear, and hope. Don’t start this novel if you have any pending commitments as you won’t be able to walk away from the last hundred pages.